The new third-generation iPad is hot not only figuratively - it sold three million units during the launch weekend alone - but also very literally. The tablet burns 10 degrees Fahrenheit hotter than the iPad 2. Five minutes after it started running GLBenchmark, the new iPad reached temperatures of 33.6° C (92.5 Fahrenheit), while under similar circumstances the iPad 2 heat level stood at 28.3° C (82.9 Fahrenheit). The results were obtained by using an infrared camera. Now 92.5 degrees Fahrenheit is far from being burning hot, but it should definitely make for a difference you can feel in your lap, hands or wherever you use your tablet. We’re curious whether you felt this already or does the temperature difference seem insignificant in real life. Share your experiences in the comments below. At the same time, more reports have sprung up saying the iPad overheats under certain circumstances and shuts down after displaying an error message. We'll definitely be looking more into that as it sounds like a dead serious issue. 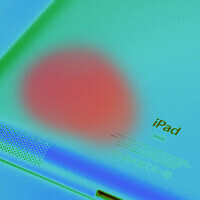 In the meantime, we'd appreciate your first hand experience with the new iPad - share it in the comments below. Wow, apple should think seriously about making heat resistant gloves for ipad users as an accessory. iglove would be an ideal name. If you don't have an iglove, well you gotta burn your hand. No doubt theyve already patented those gloves!! It's good for Winter when your hands get cold. Apple Has These unique Character of it's devices overheating... they never seem to miss that..
or may be people are just holding it wrong. lmao. Perhaps Samsung actually has rigged the screens to self destruct when an ifan presses their face against the ipad while hugging it before bed time. The heating up Is the start of a chain reaction!!! Kaboooom!! How is andro not being moderated? There's a app for that its called the ihotplate. Cook while surfing the web. Patent pending. Plain truth is that they overclocked the ARM A9 core. The GPU is unlikely to cause heating as it shuts down its clock when it is not processing OpenGL commands. The screen (at this HD resolution) may also be contributing to the heating. I'm not surprised, it has a very power hunger processor. But I wonder if it heats as much during normal use and not while running benchmarks. I find it funny that as soon as Apple has one issue with a product, which isnt too common, all the Fandroid's are so quick to comment and criticize. while I AM an Android.. I totally agree with you. Kind of embarrassing actually. Not ONE response to the question asked by the article.. I'm curious if this is really an issue with the iPad users. Because before a product is released or just released, all the iFans are like "This new iDevice is the best, Android will never catch up, Admit it! Apple products are perfect!" So when a dumb flaw like this pops up, it just a giant "We friggin told you so!" moment. Apparently websites like bgr are reporting that a complaints are starting to come in where some of the new ipads are overheating to the point where they shut down. Look like we have a potential heatgate on our hands,another apple product having faults,surely not?! doh! i was about to post something very similar. You fandroids are so creative. Been using the same joke since 2010. I guess an iOS user has to come up with a new joke so you can copy it just like android copies Apple. What you're leaving out is that it runs about 10 degrees warmer than the iPad 2 which isn't necessarily outside of what's acceptable. We will see as this becomes investigated more. When the 4S came out there were reports of battery issues and those turned out to be nothing as it was a very small percentage of devices that could be fixed either by being traded out or doing a reset on the device. I know you guys want the iPad to fail so bad, but it won't. Just accept that it is THE standard for tablets right now and move on. Yes, the standard...which means it is the lowest, the baseline, and all Android has to do is beat it. Being the standard just means it's forever at the bottom. A joke that becomes more and more relevant each year! Haha we have a jack ladies and gentlemen.smh Android copies Apple? With What?Nothin. An to answer your ibuycrap question the mobile community of course jumps on Apple's case due to them being the only ones to run iOS which they claim to be better than everything. At the same time though they're products seem to keep having at least 1 major problem. I4 can't hold the dam phone to make a call. IPad3 burns yo dam lap off. All problems that they know about or should have known about before releasing the product. So we and the rest of the world tired of Apple acting like the LeBron's off the world an claiming to be the king when there crown falls apart. so does anyone actually have the new ipad to verify/test the heat? I figured someone on this board would have answered the question by now.